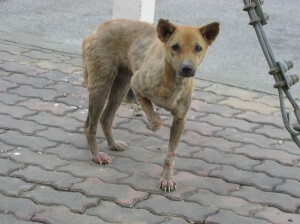 This lonely stray dog was found in front of a furniture shop in March 2006. She was very shy and would not take food from the hand. 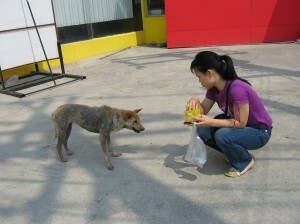 A young man came to her sleeping place every evening to give her food by leaving it in a bowl. 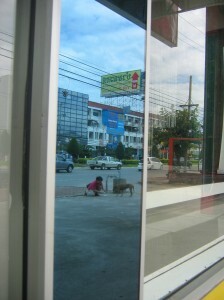 We never actually met him, but arranged to treat the dog by asking the shopkeeper to arrange for the man to mix our medicine in the food that he supplied. 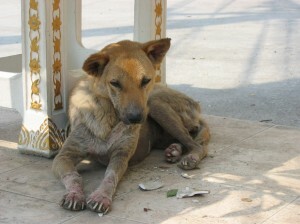 With patience, after 3 months, suffering less and looking more hopeful in her eyes. 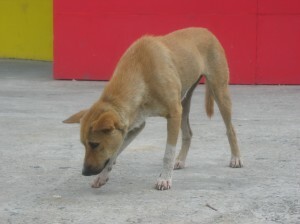 We now want her to be sterilized, but the location in which she is found is in a very open area, with little chance of catching her, and there is a danger that she might run out into the busy street and get run over. We are finding a way to catch and sterilize her. We also appreciate the man who brings the dog food every day. He is an example of kindness anyone can follow if we care for the living creatures that share the planet with us.